Johann Albrecht was the best pressman in America, according to Albrecht's fellow printer William McCulloch of Philadelphia. Johann was indeed Lancaster's most prolific printer of the 18th century. From 1787 to 1806 he printed and published more than 100 editions of German-language books, pamphlets, and almanacs. 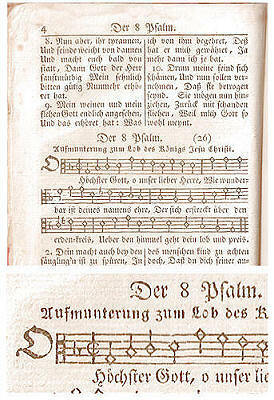 The most popular book Johann ever printed was a brand-new 1804 Mennonite hymnal ...titled Ein Unpartheyisches Gesang-Buch (A Non-Sectarian Hymnbook). This songbook was an instant, runaway bestseller. This book was uniquely challenging for Johann to print, because of the many pages of musical notation. The Lancaster Mennonites had requested that Johann print lots of musical notes in this songbook, and not just text. They said that the Mennonite hymnbook printed the previous year by Michael Billmeyer in Germantown (near Philadelphia) had too much text and not enough notes. (the 1803 Zions Harfe / Zion's Harp). Johann met this challenge by printing lots of hymn tunes in this songbook with lots of diamond-shaped notes. The local Mennonites were pleased as punch with Johann's final result. 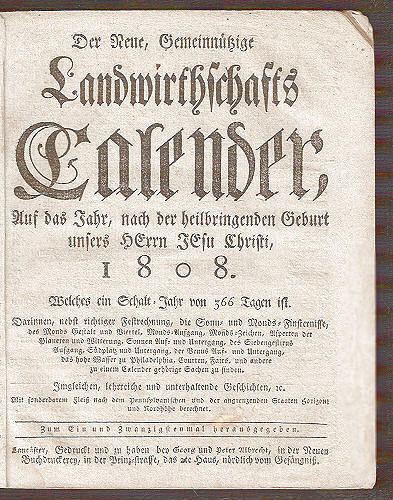 The first edition of 1804 was followed by an 1808 edition, printed by Johann's sons Georg and Peter. This book became the most reprinted hymnbook of any American Mennonite hymnbook. By the 1980s this book had been published 32 times. 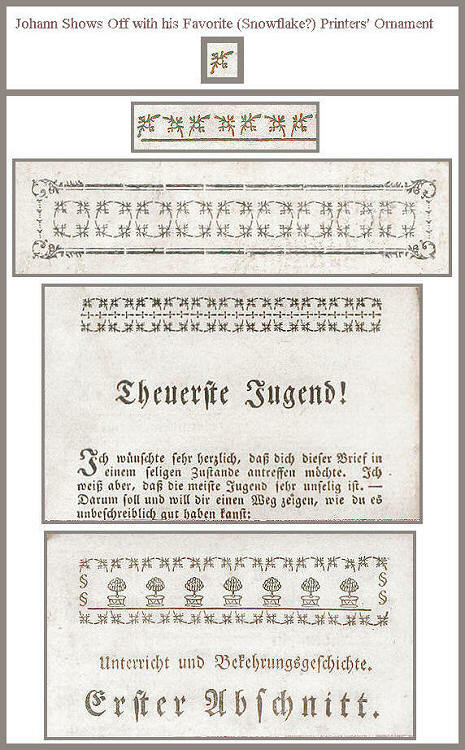 After the first two Albrecht editions, John Baer printed five more editions, in 1820, 1829, 1841, 1848, and 1853. John Baer's sons then printed nine more editions. Beginning in 1923, numerous editions were printed by the local Amish with the imprint "Verlag von den Amischen Gemeinden in Lancaster County, Pa."
Johann Albrecht's hymnbook is now the oldest American Mennonite hymnal in continuous use ...in the galaxy. Here in Lancaster County, the Old Order Mennonites and the Amish have been singing the same German-language hymns in this same songbook for more than 200 years. And next Sunday they will sing these same songs again. P.S. Thank You to the late Martin Ressler for being the definitive bibliographer of Ein Unpartheyisches Gesang-Buch. Above: A young Mennonite boy named Johannes Miller received this 1804 songbook (Gesang-Buch) from his grandfather Isaac Kaufman, on February 21, 180?. Johannes Miller (born 1797) grew up to became a prominent businessman in Manheim Township where he operated a grist mill. His grandfather who gave him this songbook, Isaac Kaufman, owned land that became today's Landis Valley Museum. 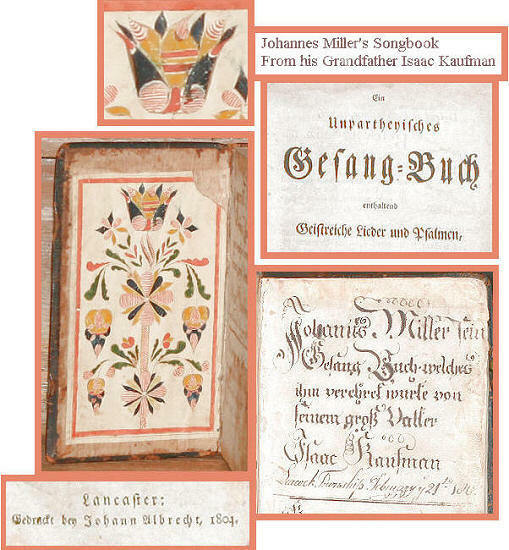 An anonymous fraktur artist created a watercolor-and-ink fraktur for Johannes' songbook, and inscribed the boy's name on the endpaper. Sometime in the early 1800s, the Philadelphia printer William McCulloch referred to Lancaster's Johann Albrecht as the best pressman in America. (in McCulloch's letters to the Boston printer Isaiah Thomas, who in 1810 authored the first history of American printing.). Maybe McCulloch was easily impressed by Johann's printers' ornaments. (Hey, I am too.) Johann jazzed-up his printing with these type-metal ornaments, to brighten-up his blackletter text. Jesus und Die Kraft seines Bluts: (Jesus and the Power of his Blood) by Johann Daniel Otterbein, a pastor in Dillenburg, Germany, who was associated with today's Church of the United Brethren in Christ. Printed by Johann Albrecht in Lancaster in 1790. Der Psalter der Könings und Propheten Davids: (The Psalms of the Kings and the Prophet David) printed by Johann Albrecht in Lancaster in 1791. 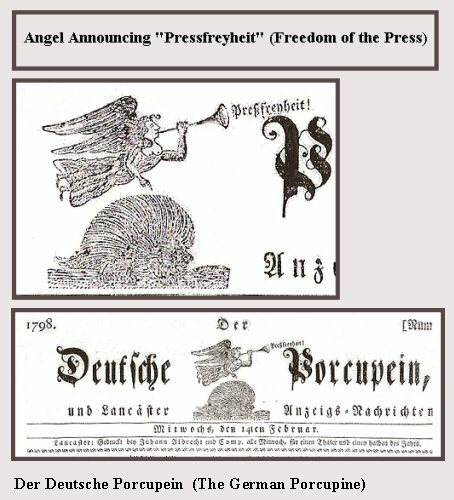 Fliegender Brief evangelischer Worte an die Jugend: (Evangelistic Pamphlet [Flying Letter] to the Youth) by Ernst Gottlieb Woltersdorf, a Lutheran teacher in Germany. Printed by Johann Albrecht in Lancaster in 1794. Das Eifrige Christenthum: (Passionate Christianity) by Thomas Watson, a Puritan pastor in England. Printed by Johann Albrecht in Lancaster in 1802. It's the first American edition, and is based on German-language editions from Basel and Frankfurt. 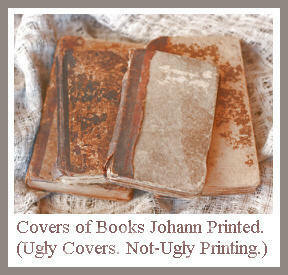 The covers for Johann's printed books are no great beauties. But they sure are pious. In 16th century almanacs and in Early-American poetry a sun couldn't just be a sun. It had to be Phoebus the Sun God from ancient mythology. And the moon had to be Diana. ...as in "...tis an omen bad, the yoemen say, if Phoebus shows his face the second day." ...or as in ..."scarce shall setting Phoebus vanish, ere the deathless deed be done," an exact quote of the very-poetic Boston Patriots when they were dumping tea overboard at the Boston Party, if you believe Early-American poets. 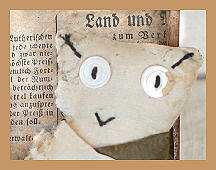 This bright-and-shining face smiles down on the front covers of all the almanacs printed by Johann and his sons. 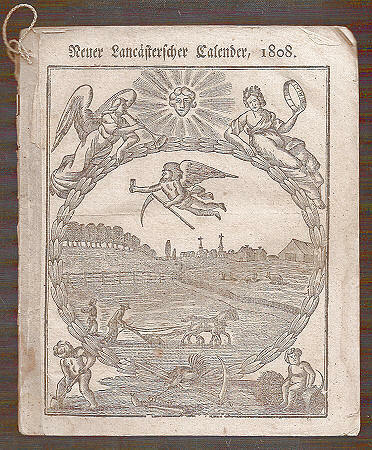 Whatever the name of that smiley-faced God, his radiance certainly was working well for Lancaster in 1808, when Johann's sons Georg and Peter printed this almanac. Lancaster City was basking in its urban prosperity. It had flourished, to become one of the largest inland cities in the United States at that time. It had even become the capital of Pennsylvania, a title the city held from 1799 to 1812. Lancaster County was equally prosperous, and had become a Breadbasket of America. It had become the proverbial Land of Milk and Honey. Thankfully that happy-faced Sun God still shines bright here in Lancaster, despite the threats of Father Time. Trinket Boxes Lined with Lancaster Newspapers, Including an 1812 Albrecht Newspaper. 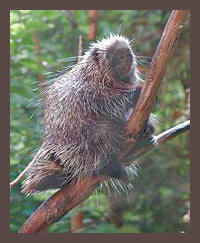 Unfortunately, in 1802 Lancaster's Porcupine newspaper (Deutsche Porcupein) lost its excellent rodent name, when Johann Albrecht renamed his newspaper Der Americanische Staatsbothe (The American Herald). After Johann's death in 1806, his sons continued this newspaper, in various forms, until the 1830s. 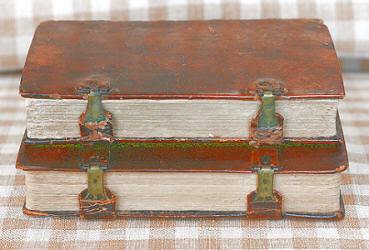 Occasionally, Lancaster newspapers were used to line the insides of straw-decorated trinket boxes. My photographs, here, show two trinket boxes lined with Lancaster newspapers. 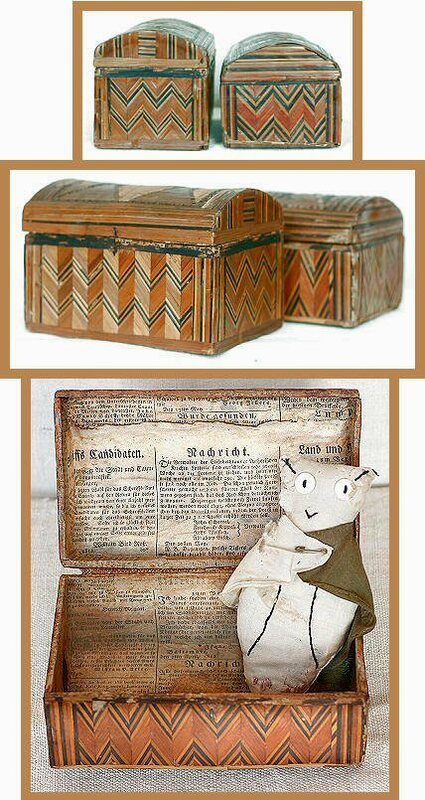 These newspapers were glued into both boxes before the straw decoration was applied, suggesting these boxes were created in the Lancaster area in the early 1800s. The one box is lined with an 1812 Americanisher Staatsbothe newspaper. (A fragment of the newspaper's masthead is on the bottom of the box.) I have not determined the identity of the 1826 newspaper inside the second box, although the newspaper's text identifies it as a Lancaster paper. P.S. The button-eyed (owl?) is from the Nissley family in Mount Joy, Lancaster County. It was probably given as a gift to Anna Nissley, a young Mennonite girl, in the 1930s.